By now, you might be having a fairly good idea of what Connecto offers, our numerous widgets and their use cases, how can you benefit using our widgets, how intelligent targeting is possible using various targeting options available etc. Since our widgets (lead forms & notifications) are coupled with a number of targeting variables, hundreds of targeting groups can be made using different combinations and marketing strategy can be designed accordingly. By segmenting the visitors of your site and targeting them wisely you can increase your conversions tremendously. Let us understand this through some examples. Such visitors may stay on your site for a very short period of time. You have to impress them and convert them into leads quickly. So, lead forms have to be shown immediately i.e as soon as the page loads. Time delay and percentage of page scrolled should be zero here. As the user intends to leave, he should be targeted aggressively by showing a compelling message that makes him to fill the Exit Intent form. For eg. On healthcare websites, visitor could be offered a free skype consultation with professionals, in case of e-commerce websites, it could be coupon code offering additional 10% discount etc. Such traffic is precious for any website. They have read your mail and landed on your site for some purpose. So, no stone should be left unturned to convert these “warm leads” to customers. This time, you already have their emails, so pitch to get their phone nos. only. Here, page level targeting is of paramount importance because the user will be landing on desired page by clicking on the mail. The lead form with call to action should appear only on the targeted page where the user will land and the language of the message must resonate with that in the mail encouraging the user to take some action. Nowadays, people mostly browse web on mobiles and tablets. Enabling lead forms or notifications on these devices increases conversions significantly. Since the screen here is small, the message in notification should be short and precise. Bar, being non – intrusive has been found to work well for mobiles. The notification should be shown immediately without any delay to catch the attention of the visitor. Sometimes visitors land on your site while browsing through some other website or while reading some blog or article (through links), they may not be much aware of your product offering. 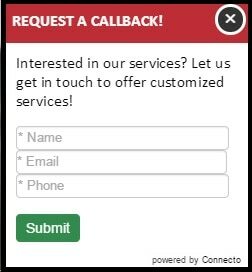 So, they should be shown a “Request a callback” form immediately without any delay. Geolocation is a great targeting variable and could be used to target people from different countries or from different cities differently. For eg. a NRI could be asked to register for upcoming NRI meet or some other event, people from a particular city say Noida could be targeted to drop their details to avail early bird discount on the property nearing possession. Similarly, in e commerce, people from select cities could be offered discounts. 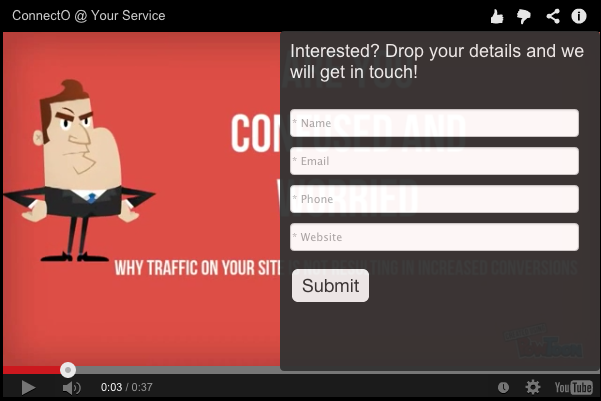 Some websites have embedded YouTube video, with Connecto’s Lead Form on embedded YouTube video widget you can now monetize your videos. Videos are known to be better engaging. Such engaged visitors when pause or finish viewing the video, a lead form slides in right inside the video and there is a very high probability that the user will fill it. Such visitors are known to be better engaged, they have come to your site with something specific in their mind. They must be attended to and nurtured properly. They could be shown side lead form asking “May I help you?” that pops up or slides in when the user session exceeds 30 sec or is more than 2 pages. If scroll based targeting is done, the scroll percent should be more than 70%. Users coming from social platform usually show better engagement and have higher conversion rates. They could be shown relevant lead forms 20 sec after the page has loaded or when the user has scrolled 70 % of the page. A first time visitor on your site may not have an exact idea of your offering/offers/new launch etc., he should be informed and guided with the help of lead forms. You can show him request a callback form with a delay of 5 sec. He could also be shown lead forms based on the percent of page scrolled. Since, he is new percent of page scrolled should not be more than 50% for serving the form. Depending on his interest level, he could be shown a bar asking for newsletter subscription. It could appear when targeting is done for user session i.e when user session exceeds 2-3 pages. He is well aware of your offering and there is a high probability that he is looking for something specific. He should be shown forms asking “ download price/brochure etc.” Here, time delay for serving notification should be more i.e 20 sec. or so. Scroll % should be 80-90% for such visitors. Since, we already have his contact details, there is no need to be too pushy or aggressive. So, there is no need for exit intent in this case. These are only a few ways of segmenting and targeting your visitors through Connecto. After creating your account and integrating connecto on your website you can create countless combinations and doA/B testing to select the most effective ones and design a campaign around that to reap the most out of Connecto. So, sign up and start exploring and in case you get stuck somewhere do reach out to us at support@connecto.io. We will be happy to help.